This 10 hour OSHA Safety course is a ten hour course. It has 9 mandatory classes and two electives. 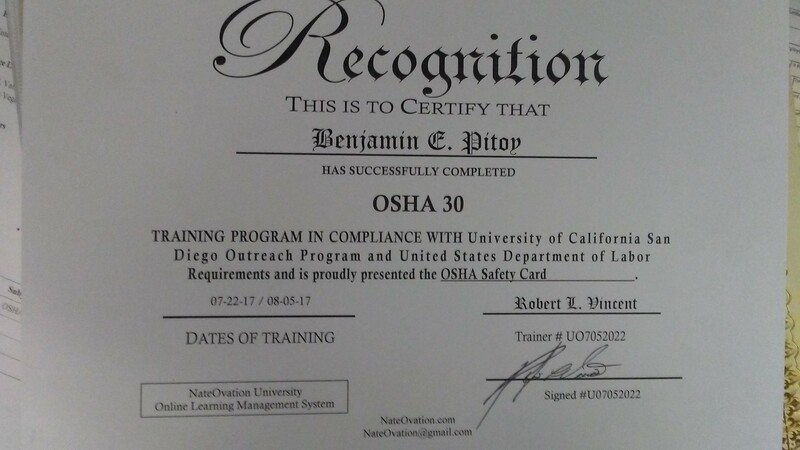 Authorized by Univeristy of California San Diego OSHA OUTREACH EXTENTION and U.S. Department of Labor. Welcome to NateOvation Institue of Vocational Training. OSHA 10-30 and Beyond. We are located at 6525 W. Warm springs Road Suite 102, Las Vegas, Nevada 89118. My name is Robert L. Vincent. I am the Safety Officer and Founder of Nateovation.com. I am a retired General Contractor with over 30 years experience in Construction Project Management, Estimating, and work. So, I have a lot to say when I am teaching class in OSHA 10 and OSHA 30. We have over 70 classes we teach, Plenty of Class room space where I can admit 1 - 30 students at one time. In Addition, we offer every class in an ONLINE Blended learning experience. (Good). On top of that we have a new Welding Certification Program with approved American Welding Society (AWS) Course content. Plus we have over 7 instructors bringing the best in talent from the welding industry. The OSHA Courses are the foundation for the rest of the LMS. I have classes in Welding Certifacation in the Steel Industry as well. Please download and printout your student class card before proceeding. As you go through each class you have to sign off on that Chapter or Modual. After you have completed your courses then you can scan your class card and send it back signed. You can take a break at any time. After I review your work I will call you.